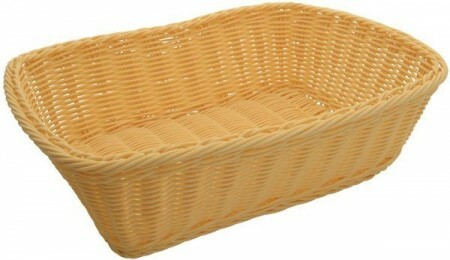 $3.21 Winco PWBN-16B Oblong Woven Basket With Handles 16" x 11"
$3.39 Thunder Group PLBB1107 Oval Plastic Hand-Woven Basket 11" x 7"
$3.19 Thunder Group PLBN1611T Plastic Hand-Woven Basket With Handle 16" x 11"
$2.76 Winco PWBN-12B Oblong Poly Woven Basket With Handles 12" x 8"
Present breads, pastries and more in style with the Winco PWBN-118T Natural Polypropylene Woven Rectangular Bread Basket 11-1/2". This bread basket features a stylish, rustic look that will add an old world charm to any table arrangement. Made from polypropylene, this bread basket is durable enough for everyday use and a great option for bakeries and other food service facilities. Thanks to its dishwasher safe design, this rectangular bread basket is hassle free to clean. Dimensions: 11-1/2" x 8-1/2" x 3-1/2"